Omega-3 fatty acids are a type of heart-healthy polyunsaturated fat, nicknamed "PUFA". These beneficial fats offer benefits to your health, most notably their effect on improving heart health. You can get omega-3 fatty acids in your diet by eating a variety of nuts, including peanuts. Since peanuts provide a minimal amount of omega-3s, they should not be your only source of this beneficial fat. Enjoy other nuts, such as walnuts, that have a higher omega-3 content. Omega-3 fatty acids are essential fats, meaning you can't make them in your body, so you have to consume them through foods or supplements. These fatty acids are long-chain, more than 12 carbons, and have the first double bond on the third carbon, which is where the "3" comes from in the name. Fatty fish and fish oil provide docosahexaenoic acid and eicosapentaenoic acid, while nuts, such as peanuts, and certain plant foods offer alpha-linolenic acid. Your body converts ALA into DHA and EPA, although conversion can be incomplete and you may not have the same benefits as ingesting DHA and EPA directly. Research has yet to conclude exactly how much omega-3 fatty acids to ingest each day, but recommendations are approximately 160 mg in your daily diet. According to the University of Maryland, you can safely ingest up to 3 g daily from supplements, since too much can lead to bleeding. Most nuts provide some omega-3 fatty acids. Peanuts have about 4 g of total PUFAs per 1 oz. serving, only a trace of which, are omega-3 fatty acids. 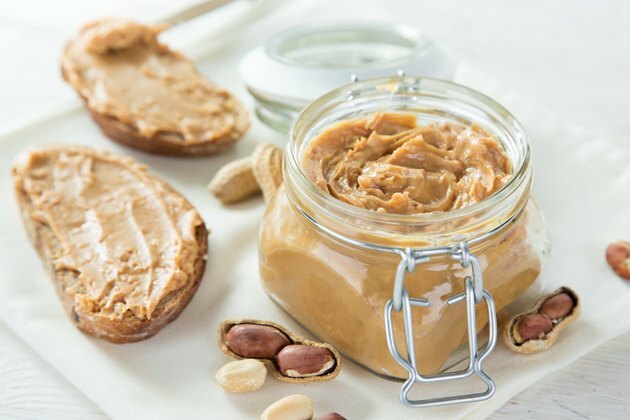 If you are looking to increase your omega-3 intake through peanuts, add some peanut butter to your diet. Certain types of peanut butter have omega-3 fatty acids added to them, providing more than 32 mg of combined EPA and DHA per 2 tbsp. serving. Omega-3 fatty acids from peanuts, or other foods, are highly beneficial for your heart. These "good" fats help improve cholesterol levels, lower blood pressure and reduce inflammation; thus reducing your overall risk for heart disease, the University of Maryland reports. Since omega-3 fatty acids have such beneficial effects in lowering inflammation, getting your daily dose of omega-3s can help reduce effects of arthritis, reducing pain and tenderness. Having inadequate omega-3s in your diet may increase your risk for depression, since these fats are essential for normal neurological function by helping nerve cells communicate. What Foods Contain Vitamin F?